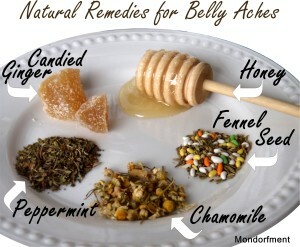 Natural remedies are what we use to treat our stomach aches. They’re safe for everyone be they baby, kid, pregnant momma or adult. We’ve been using natural remedies since before the kids were born but especially over the past week as we’ve had various belly ache bugs making rounds. Peppermint is great for gas and bubbles and is really our go to. It’s also a natural pain reliever so if you have IBS (Irritable Bowel Syndrome or Celiac) you’ll be able to relax the muscles and lining of the intestines which means your stomach ache goes away. This also works for colic as with colic comes the pain of the belly and/or gas. By drinking some tea or even giving old fashioned Peppermint Candy (make sure it says 100% Peppermint Oil) you can help calm and soothe that ache away. I steep peppermint tea using 1-2 tsp in cup of hot water for 8-10 minutes and sweeten with honey. Now, peppermint is also a natural cooler so make sure they’re in a nice, warm spot. Fennel seed, or those brightly colored candy you get after a meal at your FAVORITE Indian restaurant, helps with digestion. This will help your body process the food and fats that are hanging around just…sitting in your stomach. I often give the kids some before going to certain events that involve greasy, fast foods like pizza or hamburgers to stimulate bile production. They love it as it has a bit of a licorice taste. I love it as it also freshens your breath which is helpful when everyone but you enjoys onions. All you have to do is chew some fennel seed. If you only have seed you can sweeten it up by taking a teaspoon of honey and mixing it with a tablespoon of fennel. This will give about three, one teaspoon sized servings. Baking soda acts as an antacid. Think of the medicine you add to water and watch it fizz. Well, this does the same thing at a MUCH more affordable price AND you don’t have to worry about what’s really in it. We take the juice of a lemon, a 1/4 tsp of baking soda and some honey, Stevia or Xylitol to sweeten it. Mix the lemon juice and the honey and get ready to chug it after stirring the baking soda in. The bubbles help release gas and the baking soda helps to neutralize the acids in your stomach. My dad and hubby take the baking soda in just water which is TOO salty tasting for me. This is also the only stomach “medicine” that doesn’t raise my dad’s blood pressure. Ginger, like Fennel, is a bitter which helps with digestion and nausea (morning sickness). Ginger’s also a warmer. It’s kinda spicy or it IS spicy if you steep it too long. I give the kids ginger candy I make as it’s more of a treat. Again, be sure to TASTE your tea before giving it to a little one. Sugar will help take the bite out of ginger tea a bit but I normally add mint or chamomile. Chamomile is a relative of ragweed so IF you are allergic to it you may want to avoid chamomile. Then again, some people have found using chamomile actually lowers their sensitivities to ragweed. But, back to bellies.. it’s a great soother. It calms bellies, relieves stress/anxiety and can make one sleepy so they sleep it off. I give a cup to the kids whenever they get butterflies. And remember, I’m not a doctor nor do I play one on TV. Thanks for the good ideas! We’ve used some before, but some are new. Really helpful and informative post. I’ve used chamomile and baking soda before but will have to try the other suggestions. Isn’t baking soda salty! 😉 That’s one I don’t like to do for natural stomach ache remedies! Great post! We’ve had a lot of stomach troubles here this week so I’m going to put some of these to use. I love peppermint tea at anytime and those fennel candies too! I use to have really good recipe for some that I’m going to have to look up now that you have me thinking about them. I’m visiting from the BYB challenge thanks for participating. Oh yeah…the fennel’s a good way to help with bellies. I LOVE them. Holler at me when you find your recipe Kim. I’d love to have a copy. And I’m glad you’re participating in the challenge! Oh!!! The Sunshine Award!! Thanks Ashley!!! I just saw this and I’m honored! 🙂 Heading over to check it out! Generally I don’t read post on blogs, however I would like to say that this write-up very pressured me to take a look at and do it! Your writing style has been surprised me. Thank you, very great post. Great post! Really helpful and love the photo. Keep these post coming!